Die Villa Sivota ist mit 220 qm die größte Villa in der Nähe des Bootsanlegers. Sie ist außergewöhnlich geschnitten und perfekt gelegen. Der Strand ist in direkter Nähe und das Dorf Sivota mit Geschäften und Tavernen nur 5 Minuten entfernt. Die Villa Sivota ist ideal für Menschen die Luxus, Privatsphäre und Komfort in einem großzügigen, voll ausgestatteten Haus suchen. Mit hohem Standard und einzigartig gelegen ist die Villa perfekt für einen himmlischen Urlaub. Die technische Ausstattung der neuesten Generation und sogar ein privates Kino sind einzigartig. Unsere neu erbaute Villa liegt inmitten von Olivenbäumen und der Blick ist auf das Meer ausgerichtet. Unter Berücksichtigung von Komfort, Luxus und Ruhe ist besonderer Wert auf die Bauqualität gelegt worden. Gerade einmal 50 Meter vom Bootsanleger entfernt, ist die Villa Sivota ideal für Bootsliebhaber; haben Sie einen direkten Blick auf Ihr eigenes Boot oder Sie genießen einfach die Aussicht auf den kleinen, lebendigen Hafen mit den ein- und ausfahrenden Segelbooten. Die Villa bietet Ihnen höchsten technischen Standard und eine Ausstattung hoher Qualität wie z.B. LCD-Fernseher, sowie ein privates Heimkino im Untergeschoss. Sie gehen einige Stufen von der Terrasse herunter und sind direkt auf der großzügigen Poolterrasse mit Pool (9 x 4m), Außendusche und der Möglichkeit für ein ausgiebiges Sonnenbad. Der Bereich bietet Ihnen vom Pflanzen umgebene Deckchairs, ein großes Sonnensegel und einen wunderschönen Blick auf den kleinen Hafen. Etwas unterhalb in einem Olivenhain finden Sie eine Hängematte mit schönem Blick. Hier finden Sie ein Schlafzimmer mit einem Queen-size Bett, 46“-Fernseher, ein Badezimmer mit Badewanne sowie einen privaten Balkon mit Hafenblick. Die Küche ist mit Ceran-Kochfeld, Ofen, Mikrowelle, Spülmaschine, Kühl-Gefrierkombination, Küchenmaschine etc. voll ausgestattet. Das Wohnzimmer hat einen 46“-Fernseher und ein HD Sound System und einen traumhaften Blick aufs Meer. Ein Schlafzimmer mit Queen-Size Bett, 40“-Fernseher, ein Badezimmer mit Dusche, sowie ein separates WC. Die Terrasse ist nach Süden ausgerichtet und hat Meerblick. Hier finden Sie ein Schlafzimmer mit zwei Einzelbetten, 40“-Fernseher und ein Badezimmer mit Dusche. Eine zur Bucht ausgerichtete Fenstertür führt sie in einen kleinen Patio von dem aus Sie direkten Zugang zum Pool haben. Ein Haushaltsraum mit Waschmaschine und ein optionales Kinderzimmer mit zwei Einzelbetten. Das private Kino mit 99“ Leinwand, Full-HD-LED Projektor ist ebenso professionell wie das Full-HD 5.1 Sound System. Ein Blu-Ray Player, eine Wii und eine Xbox 360 sind vorhanden – bitte vergessen Sie nicht Ihre Filme und Spiele mitzubringen! This charming private terrace to the master bedroom. 4th bedroom with 2 twin beds near the cinema hall. Various facilities to enjoy the different times of the day. it's time for the aperitif !! All for a dream holiday, just enjoy. TV lounge 46 "and its fresco inspired by the sweetness of life in Greece. We had a wonderful holiday in our Sivota villa and were truly looked after by Anna and Mema. Thoroughly recomended! Lesley and Chris New Zealand. Our two week stay at Villa Sivota was magical. The family holiday was to celebrate my 70th Birthday in a country and Island we have grown to love. The location was perfect - we could wander the village of Sivota- go tramping in the lovely hills - swim in the sea or do what we mostly did - stay home and relax in the pool and garden. The service we received from Mema and her Team was amazing - 10/10 to them all. With ages ranging from 76 to 21 months - 10 people had the best ever holiday together at Vill Sivota in July 2018. Thank you all at Lefkas Travel and especially Anna and Mema. Our guests arrived to a very clean, almost immaculate villa. They ‘welcome basket’ was so well thought out. From fresh fruit to cold wine, beers and water in the fridge, ice in the freezer and all of the basics for a relaxed evening, after a long flight. Mema was on hand whenever we needed her, and always with a wonderful sense of humour. The villa is beautiful and carefully laid out. With large areas for group gatherings and small, quiet ‘nooks’ tucked away for those who wish to have some quiet time. The cinema was a WOW, but unfortunately, everyone was having such a great time in the pool, or in the village that it was used only once. The entire villa was very well equipped and we lacked for nothing. Would we recommend it, or would we come again? A definite YES! Highly recommended on every point. The booking of Villa Sivota through to the check in was professional and efficient. Thank you all again from a very happy family. A holiday we shall all remember. We had an excellent stay at Villa Sivota. The house has everything you could possibly want/need and it is in the perfect location, just 5 minutes walk to the village where there are numerous tavernas and shops. There are 3 small supermarkets which provide everything you need so you don't have to leave the village if you don't want to. Meme from Villas Thalassa was always at hand if we needed her, and she went out of her way to make things as easy as possible for us. The house was cleaned thoroughly every day by a lovely group of people who did the Job discreetly when we were in the house. We will definitely be returning to Villa Sivota and we would thoroughly recommend it to others. Everything was perfect from the pickup at the airport to the amazing villa, the location is outstanding - afew yards away from bars and picturesque restaurants.we were so sad to leave p.s the villa cinema room was fantastic!!! Perfect Villa for our needs! I am a villa "anorak" I spend hours checking villas , dismiss many and check the few good ones on google earth . Villa Sivota was as good or better in every way . Trust me , I'm hard to please . The only downside ? The sea was v. Cold , maybe I'm just getting soft. From the best experience ever! I love Lefkada it is an amazing island. Un lieu magique où les 18 ans de notre fils resteront à jamais gravés dans nos mémoires... Que demander de plus ? Une adresse a ne pas manquer ! For sure this island is a paradise. The house is situated perfect! Daily cleaning good and very helpful and friendly. Water pressure on first floor is poor, not what you expect by a luxe villa. Great place to stay, it was just the two of us for a week. Villa has all the mod cons and great internet reception. We had some mixed weather, so the cinema room and film library was a godsend. Definitely will look at coming back again and staying here. I can't get enough of this villa and Sivota. Just perfect! Villa Sivota is ideally placed it is literally within the 150m of the harbour, this being crescent shaped (c800m) and full of bars/restaurants. Being a very calm and protected harbour Sivota is used as a base for many yachts, as well as several local fishing operations, so there is always activity on the harbour side and the local fishermen keep the restaurants very well stocked with excellent reasonably priced fresh fish. Sivota isn’t exactly up market or a great gastronomic delight but will appeal to those looking for a more casual experience. The villa is fully stocked with crockery etc has four bedrooms (three ensuite and is fitted out in a contemporary style – almost exclusively from Ikea! Lots of nice outdoor seating in sun and shade. One minor point is the lack of blinds etc at most of the bedroom windows, meaning you awake at sunrise. The cinema room is very good and we enjoyed that to the extent of deciding to incorporate one in our own home! The local infrastructure is not too robust and during our stay we lost both water and power (during a storm to be fair) and had relatively poor internet signal throughout our stay, this being fine for emails and general internet use but not good enough for the gamers in our party. The “no toilet paper down the toilet – no matter what used for” is a little off putting! I would stress these that all these infrastructure matters are general locality rather than villa specific issues. All of the people we dealt with in respect of the villa could not have been more helpful. Anna (manager), Jerome (the operations guy) and Debbie (the house maid) all did everything they could to be helpful always responding quickly and positively to all our queries, they certainly made the booking process and stay stress free. 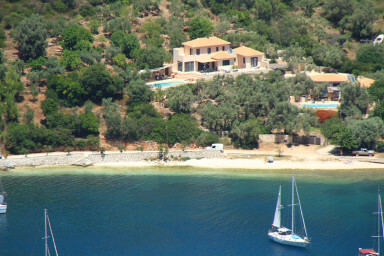 We would definitely like to return to Villa Sivota and have no hesitation in recommending this villa. Excellent villa in a lovely , highly convenient location. Beach and village at your footsteps. House is super clean, well maintained by lovely caretaker Jerome and Debbie for the daily cleaning. A call and Jerome was instantly available to help!